Hero Dogs “Murphy” is partnered with occupational therapist Jen and works at Brookedale Westminster. Murph brings great joy to residents daily as he works with Jen and physical therapist Lisa, enabling residents to keep their strength and independent mobility as long as they can. Murph’s special brand of gentle affection brings a smile to every face. It’s time. We have been looking forward to (and dreading) this day since you came to us. Like the Hero Dogs before you, you have always been destined for greater things and it is time for you to return to Hero Dogs. You have trained hard, you are big, you are strong, and you are ready. Before you go, we want to remind you that you did not get to this point by yourself. As they say, “It takes a village,” and you had help from a very dedicated team. You probably don’t remember this, but you were born at Boynton’s Labradors right here in Germantown. 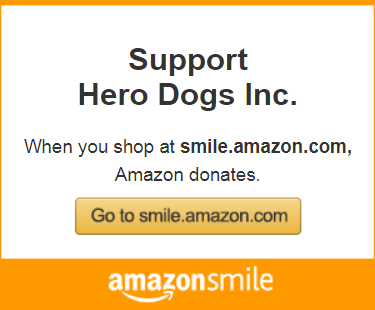 It was incredibly generous of them to donate you to Hero Dogs. And don’t forget all the great stuff you got from your sponsors, Carlyn and Jeff Weaver. They provided your toys, vests, harnesses, collars, leashes, and kennels among many other things. And Virginia Overstreet provided your Puppy Scholarship. With that scholarship, you got to attend Puppy Kindergarten (twice) and Puppy II class. At those classes and the following Hero Dogs classes, Jennifer, Becca, and Tammy made sure we prepared you to be a well-mannered dog as well as a future service dog. And, of course, we should thank the Murphy family for allowing us to use such an honored name. Recently, a man on Facebook commented that you could never live up to the hero status of LT Michael Murphy. But he mostly missed the point. Like many Hero Dogs, you were given your name as a tribute to an American hero. But you will be your own hero and now you (and the Hero Dogs team) will author the next chapter of your story. Remember, not every dog in the program becomes a Hero Dog. It is very important that you work hard and pay attention to Jennifer, Becca, and the Hero Dogs volunteers during this next phase of your training. When you came into our home, we had already raised Hero Dogs Grant. So we were pretty sure we knew almost everything about raising a Hero Dog puppy. We were wrong. It turns out that puppies develop differently and have different personalities and strengths. The day after we got you we all drove to Florida for vacation and we had fun. Your early unique (and challenging) trait was to just stare at us when we were outside for extended periods imploring you to “Get Busy” only to give up, bring you back inside, and then have you immediately “Get Busy” inside the house. This seemed to be one of your favorite activities. But, like all Puppy Raisers, we worked our way through that challenge. When Grant came into our home, Java had no idea what to do with another dog, let alone a puppy. Over time, he won her over. So when you came into our home, she was ready to be best friends with you. While you were here, you brought out her inner puppy. She will miss you terribly. As a reminder, Phase II may be the most challenging step in your training. But it is only the next step to being paired with your Veteran partner. Whoever that person is, they will be very lucky indeed. While we have every expectation that you will succeed, if for some reason it does not work out that way, you will always have a home with us. Happy Spring from Hero Dogs "Murphy"
Well, it’s been quite a while since I last updated my blog. And for those of you that follow me, you know that’s unusual because I rarely miss a month. But there are a couple of good reasons why you haven’t heard from me lately. The first is that Brent bought a new tablet for us to share. I’m still getting used to this thing and my paws definitely work better with a mouse than this touch pad thingy. But more importantly, I’ve been busy as a service dog. Brent got in a bicycle accident on his way to work one morning and was laid up at home while he recovered. We can joke now about me having my own disabled Veteran to take care of, but in truth all of my training did pay off and I really stepped up my game. I laid quietly when he didn’t need me and gave him comfort when he needed that. I helped him take off his shoes and socks when he couldn’t reach them. And more than once when he dropped something, like the TV remote or his keys, I picked them up and gave them back to him. I even helped him with his blanket. He said he was proud of me and I made his recovery better. Now that he is mostly recovered we are really enjoying the nice weather. Much like Hero Dogs Libby, I can’t chase the tennis ball enough. I do miss my little soccer ball after I bit down on it a little too hard. But my tennis balls are keeping me busy. It’s even more fun when it’s muddy. I don’t understand how Brent and Jamie get tired before I do. All they have to do is stand there and throw the ball. My training is right on track. Jamie and I go to Hero Dogs every week and learn new skills. I’m currently working hard on “UNDER.” That’s a tough one but it’s important to use on a train or bus. We also go on lots of outings to stores and restaurants. Brent has even taken me to work with him so I could meet his coworkers and learn to be quiet in the workplace. So you can see I have actually been bisy, I mean bizzy, auto-correct busy (<= darn touch pad again). Jamie said as soon as I finish my blog, she would throw the tennis ball for me. Yeah!! Click here to read Murphy’s full blog.